Central Coast and Whitsundays up to 1 meter of rain now forecast! 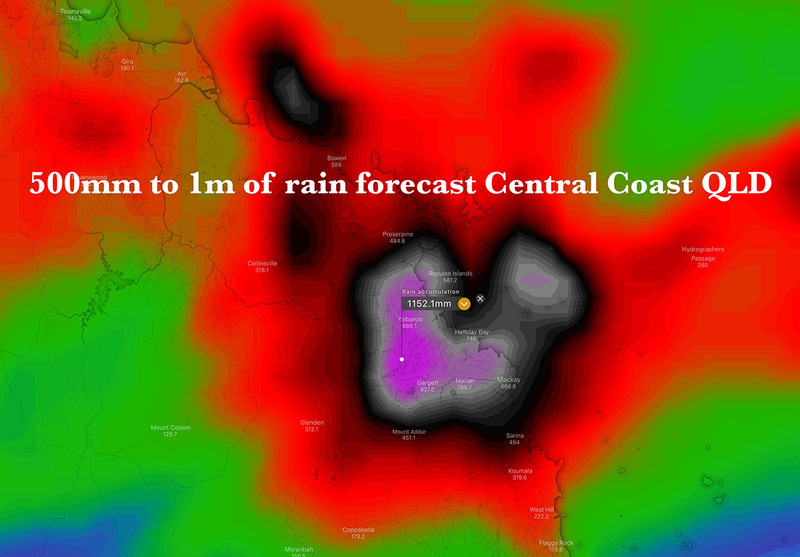 Home/Forecast/Central Coast and Whitsundays up to 1 meter of rain now forecast! Issued 4th February 2019. HEADS UP Central Coast and Whitsundays from Sarina to Bowen including Mackay, Proserpine and Arlie Beach. The monsoon trough which has flooded Townsville during the past week is now forecast to shift South. Heavy Rainfall and Flooding a high risk. Above image via Windy.com next 3 to 5 day rainfall totals. A tropical low is currently located over North West QLD with a strong monsoonal wind flow extending down the NQLD coast. 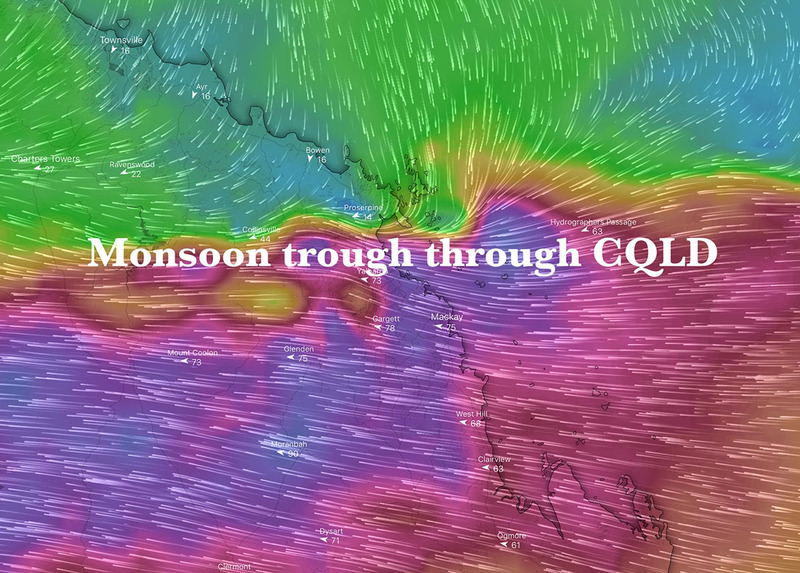 The monsoon trough which has been anchored over Townsville for many days has now finally shifted. Unfortunately this will mean other locations will now likely experience heavy rainfall with a high risk of flooding. During Wednesday the forecast is expected to be near exactly the same as Tuesday. On Thursday and Friday the tropical low could finally move East out of North West QLD into North East districts. This is likely to contract the monsoon trough back towards the North but deep onshore winds will maintain rain through the Central Coast and Whitsundays. 3 to 5 day current rainfall accumulation totals are forecast to be between 500 to 1000mm from Proserpine to Sarina. Inland areas such as Moranbah, Collinsville and Bowen are currently expecting 150 to 300mm. Flash flooding will be a high risk, River Flooding is likely with strong to damaging winds for the next 3 to 5 days along the CQLD coast. Please watch our LIVE VIDEO update and forecast on Facebook tonight (Monday) at 7:30pm QLD time which will also cover Townsville to Mackay. Detailed, accurate HSC forecasts and maps for Queensland available via our Premium Membership HERE!